Last week , I met one of my filipina friend here in Norway. They just came back from their vacation up in the mountain. They stayed in their own cottage or cabin for two weeks together with their kids. She told me that they used pine beds in most of their sleeping rooms there. I am confused what pine beds are. So I tried surfing online, I found out that these kind of beds are very strong and the wood can take a lot of wear and tear. 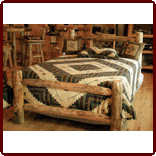 The beds are warmer and have lighter tones, but are of softer and lighter quality. It also says that pine beds are easily available in the market nowadays. Another good thing is that, pine beds are also very good for the environment. So why not checking out more for this kind of bed? Who knows one day , I will decide to have one here at home also. I am sure it will gives more rustic look to our room. So what do you think folks? Check now ! This entry was posted on 3:37 PM and is filed under Blogging , pine beds . You can follow any responses to this entry through the RSS 2.0 feed. You can leave a response, or trackback from your own site.